Comments: Though it?s not usually the first thing that comes to mind when thinking about the Princess Leia Organa (in Combat Poncho), this was the last figure of this character produced. Unlike the other human leads in Return Of The Jedi, Kenner failed to produce any Power Of The Force figures in her likeness. Granted, one can hardly blame the toymakers since this figure was loaded with four accessories --including a material poncho and a removable helmet?and still warmed pegs across the globe. Major Variations: Though all vintage figures have minor variations, the Princess Leia Organa (in Combat Poncho) action figure was produced using at least two different sculpts and featured a couple unique spray op variations. There are two different body sculpts currently known to exist, though the differences are subtle and hard to spot in most photography. 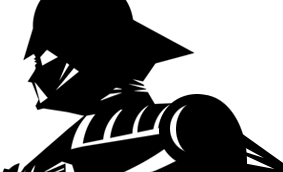 The first version of the body sports a rank bar (upper right side of torso) with four shapes: (left to right) One wide vertical rectangle, a small vertical rectangle on a small square, then a skinny vertical rectangle; less detail on the breast of the shirt; and a rounded shoulder pattern on the back of the torso. The second version can be spotted by its five square (four together making a larger square, followed by a single square) rank bar, much higher detail on the shirt breast, and pointed shoulder pattern on the back of the torso. To date, all known examples of the Version 1 arms and torso were moulded in a slightly darker, grayer plastic. Due to the different spray ops used on the eyes, (coupled with the slightly different shades of brown used) it is truly difficult to spot any differences in the variation?s sculpts, though it does appear that they may indeed be slightly different. Considering this figure features a removable head it is impossible to say that any head spray op variations were exclusive to either of the body sculpts. There are two distinctive, yet similar Poncho Belts produced for the vintage line. At first glance they seem virtually identical, save the amount of tightness settings on the right side. 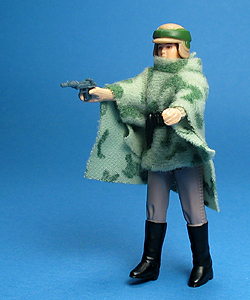 The version with two settings was packed exclusively with the Princess Leia Organa (in Combat Poncho) action figure, while the one with three settings was produced after, using the same design, to go with the Luke Skywalker (in Battle poncho) figure. Even though it is not impossible that either figure could have been packed with the wrong belt, it was never an intentional variation. To date there are no confirmed examples of this happening, but unless the belt was packaged on the figure backwards, there is virtually no way to prove it exists.